Want to skip years of guitar lessons, but still want to rock? 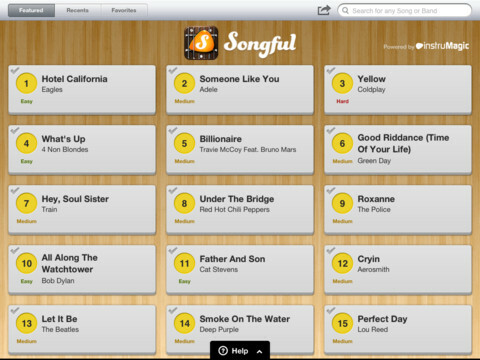 The Songful iPad app has a simple interface that makes it possible to play guitar from a selection of more than 200,000 songs. All you need is a bit of rhythm and $2.99 in your iTunes account to download and play your favorite songs. The Songful iPad app opens with a neat, tight home screen. The background is the light, bright wood grain of an acoustic guitar, and there is a matrix of songs. A navigation bar at the top of the screen with one-touch search options move you between lists of featured, recents, and favorites. A search icon is also available at the top of the navigation bar to quickly find a song. For each song listed on the screen, the name of the song, artist, and level of difficulty are concisely presented. The songs are marked easy, medium, and hard. The more quickly you can coordinate the movement of your opposing thumbs makes it possible to try and master the more difficult songs. You can touch the help icon at the bottom of the screen, and a tutorial video will slide up. This is a helpful, straightforward video to ensure easy use. When you select a song, you are transported to the guitar screen. On the left side of the screen, there are two arrow buttons. To the right side of the screen, you will find the strings of the guitar. The song fills the middle of the screen with chords and lyrics. You tap the larger arrow button to move to the next chord, while you strum the strings with your right thumb. As you continue to tap the arrow to move forward, the number of strings you must swipe are highlighted. When you mess up, you can press the smaller back arrow to give it another try. Essentially, you just need to know how a song sounds, and you can get into the rhythm quickly. You can add a song to your favorites feed with a touch, as well as post to your Facebook timeline and Twitter feed. Additional features allow you to switch from guitar to ukulele, as well as thump on the body of the guitar. Songful is not only fun, but also has incredible sound quality. It is a blast for music nerds, karaoke fans, and virtually every one in between. And, perhaps, it’s just cool enough to convert a couple of air guitar players into Songful guitar players. AppSafari review of Songful was written by Jenni Ward on November 17th, 2012 and categorized under App Store, Education, Featured, iPad apps, Music. Page viewed 5726 times, 1 so far today. Need help on using these apps? Please read the Help Page. 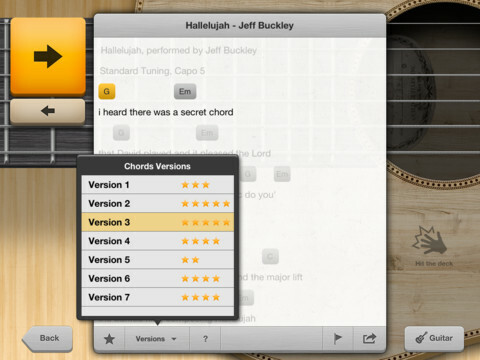 instruMagic released a FREE version of Songful for Christmas – including 3 carols, so you can see how it feels to play guitar songs on your iPad.